Create and extract more than one archives at same time. Split or Join Files and create self extracting achieves. Find duplicate files and calculate hashes. Installing Peazip on Ubuntu 15.04 is easy, if you are using 32 bit ubuntu , run following command to download Peazip installation package. As soon as the download is complete, run following command to install it. If you are using 64 bit Ubuntu, run following commands to download and install this utility. Lauch peazip using Applications >> Peazip option and you should see a user friendly File Manager loaded with important options available on the menu bar for easy access. Simply click the files you want to archive/compress and click “Add” option, and then choose the type of archive you want and click “Ok” to complete the compression task. You can extract the compressed files using “Extract” option. “Secure Delete”, “Extract All” and “Convert” options are also very useful for daily needs. 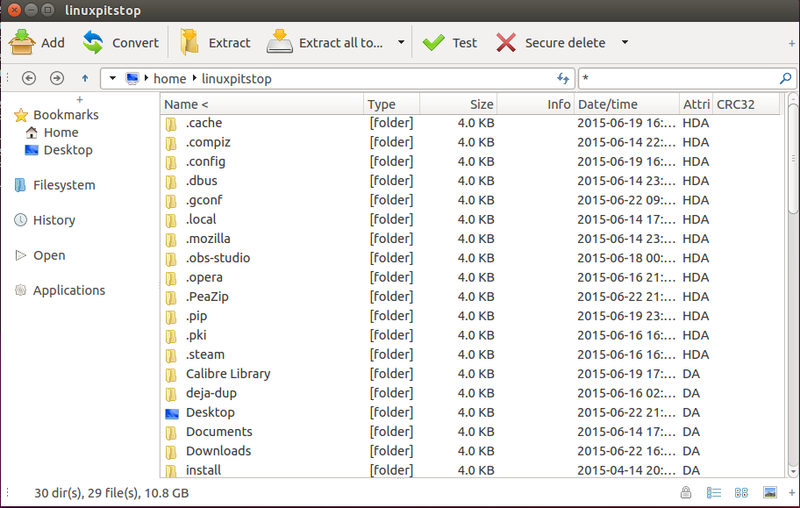 Peazip is lightweight and feature rich application; it’s a must-have app for Linux desktop users as it offers many cool features as compared to the default file manager. It runs fine on both Windows and Linux operating systems.